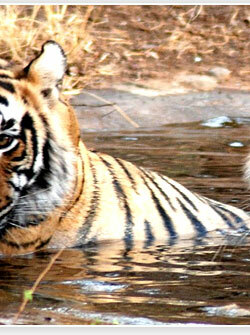 Ranthambore National Park, before a princely game conserve is the scene where the celebrated Indian Tiger is best seen. 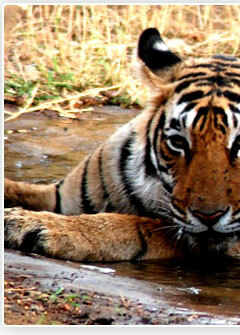 Ranthambore Tiger Reserve lies on the junction of Aravali and Vindhyas just 14 Kms from Sawai Madhopur in Eastern Rajasthan. It sprawls over a varying and undulating landscape. 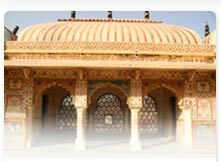 The scenery changes dramatically from gentle and steep slopes of the Vindhyas and sharp and conical hills of the Aravali. A tenth century fort also blends amicably with the background. Pure sands of Dhok (Anogeissus pendula) interspersed with grasslands at the plateaus, meadows in valleys and luxuriant foliage around the canals make the jungle. Three big lakes  Padam Talab (meaning Lake), Malik Talab and Raj Bagh  are similar turquoises studded in the vast forest that abounds with aquatic vegetation including duckweeds, lilies and lotus. A significant geological feature within the park is the 'Great Boundary Fault' where the Vindhaya plateau meets the Aravali range. The Rivers Chambal in the South and the Banas in the North bound the National Park. The park is dotted with steep rocky hills and the dominating architecture of Ranthambore Fort (built in the 10th century), adds to its landscape. The rugged park terrain alternates between dry deciduous forest, open grassy meadow, dotted by several lakes and rivers that are only made passable by rough roads built and maintained by the Forest Service. 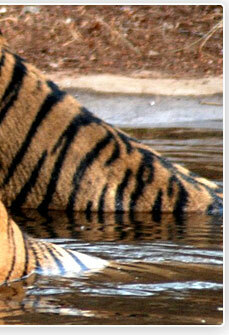 The tiger is not the only attraction at Ranthambore; although it is the one park resident that people come to see. A variety of birds including Owlets, the ubiquitous Langur (monkey), Leopard, Caracal, Hyena, Jackal, Jungle Cat, marsh Crocodiles, Wild Boar, Bears and various species of Deer are the other attractions. Ranthambore is plagued by the typical problems encountered by all game reserves in India - people living in and around the parks and grazing by livestock! Between 1976-1979, 12 villages within Ranthambore National Park were resettled outside the designated park area with only a few people now residing in scattered hamlets within the park. 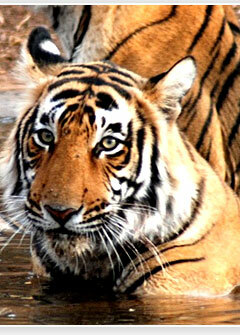 The tiger is not the only attraction at Ranthambore; although it is the one park resident people come to see. We were lucky to see several varieties of birds including these owlets peering through their burrow pictured here on the right and of course the ubiquitous langur monkey. Other animals in the reserve include leopard, caracal, hyena, jackal, jungle cat, marsh crocodiles, wild boar, bears and various species of deer. The main food source for the tiger is the swamp deer like Barasinsga and on occasion the wild buffalo and also wild boar etc. If you wish to stay near the park, the facilities on offer are superb. The park gates open a half hour before sunrise and close half hour after sunset. The timings are vigorously imposed and no exceptions are made to this rule.